Don’t Miss….The Glass Slipper Prom Dress Sale Tomorrow, Sat. April 1st from 9-12 at Effort church! 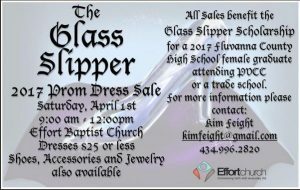 Proceeds benefit the Glass Slipper Scholarship for a FCHS graduate going on to further her education at either PVCC or Trade School.